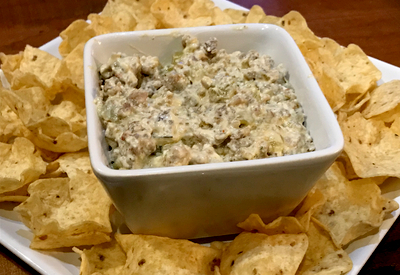 If you are getting ready for a tailgate party or if you need a quick and easy appetizer recipe than Cream Cheese Sausage Dip is your answer! I began making this recipe many years ago when I attended a tailgate party at a friend’s house. We were talking in the kitchen as she was browning sausage in the skillet. I asked if I could do anything to help out, and she turned the spatula over to me. She instructed me to continue to brown the sausage and when it was ready, drain it. No worries, that was simple enough. After I drained the sausage, she then yelled from another room to add a block of cream cheese and green chilies to the skillet. She had everything on the counter and the instructions were easy enough to follow. I pulled back the foil of a block of cream cheese and emptied the entire contents of a small can of green chilies in the skillet. 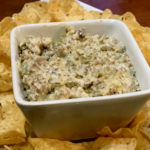 You can use any type of ground sausage that you would like in this dip. I waited until the cream cheese melted and asked my friend what was next. She laughed and said I was finished. The cream cheese sausage dip was ready for the bowl! Shocked at how easy this recipe was, I was hesitant to give it a taste. I dipped one tortilla chip in the bowl, and I was hooked! This 3 ingredient cream cheese sausage dip not only was easy to make, but it tasted incredible! I have been making it ever since. Not only for tailgate parties but for family gatherings, picnics and holiday parties. It is a huge hit and I always get requests for the recipe. I prefer to add the ingredients to a 1.5 quart slow cooker so the dip stays warm throughout the party. You can make it with any type of sausage that you prefer. When it is just our family and close friends, I use a spicy ground sausage mixture. However, if I am taking it to a holiday party, I will tone it down a bit and use sweet Italian sausage. 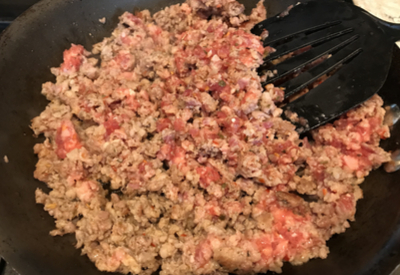 If the cream cheese sausage dip is not being served as an immediate appetizer, I will place the cooked and drained sausage in a small 1.5 quart crock pot and then add the cream cheese and chilies. This will help the dip stay warm for several hours as the party proceeds. So the next time you are looking for something new to serve, give this cream cheese sausage dip recipe a try! Cream cheese sausage dip served with tortilla chips. Just three ingredients makes up this delicious and easy to prepare dip. Perfect for tailgates or as an appetizer during the holidays. Add the cream cheese and diced green chilies to the skillet and stir frequently until blended. Once the mixture has heated through, stir and serve with warm tortilla chips. 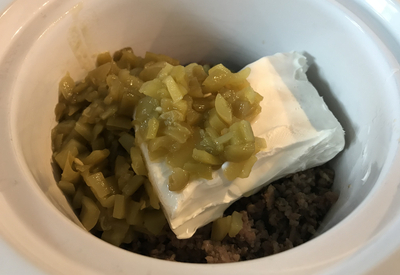 Option – After you brown and drain the sausage, place it in a small slow cooker along with the cream cheese and green chilies. Heat and stir until the cream cheese is melted. Serve warm or let sit until ready to serve, stirring occasionally.